Mark Sawkins is always busy tinkering away on his Workbench at his base in Toulouse in southern France. It’s not your traditional wooden workbench, covered in sawdust, soil or splattering of paint. Nor is it one carpeted in documents lit by the warm glow of a computer monitor. In fact, the workbench Mark is working on is virtual, having no physical form and residing solely online, or on a user’s computer, once downloaded. Known as the Breeding Management System (BMS) the Workbench, comprising software tools linked to a database for access to pedigree, phenotypic and genotypic data, has been developed by GCP’s Integrated Breeding Platform. The BMS has what a crop breeder would require to conduct an analysis of phenotypic and genotypic data generated as part of a crop-breeding or evaluation experiment, covering a broad spectrum of needs from conventional breeding to advanced molecular breeding applications. Version 2 of the Breeding Management System was released just last month. 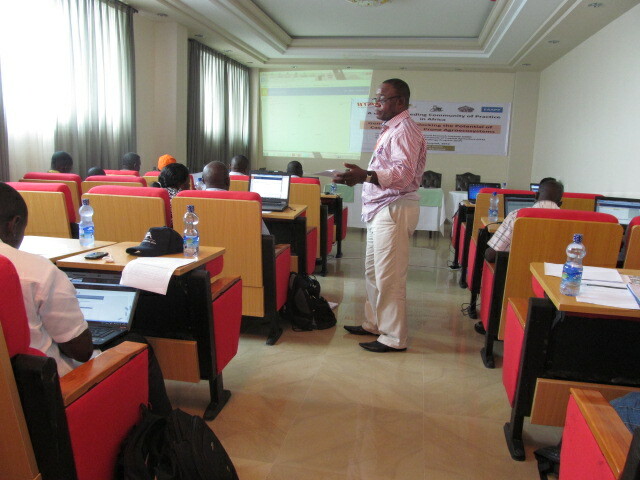 A hands-on BMS orientation workshop underway for breeders in Africa, held in Ethiopia in July 2013 under the auspices of the GCP-funded cassava breeding community of practice. Standing, Yemi Olojode, of Nigeria’s National Root Crops Research Institute (NRCRI), Umidike, who was one of the trainers. Previously known as the Integrated Breeding Workflow System (IBWS), the BMS incorporates both statistical analysis tools and decision-support tools. The tools are assembled in a way that data can flow seamlessly from one application to the next in tandem with the various stages of the crop-breeding process. It allows the breeder to accurately collect, securely store and efficiently analyse and synthesise their data on a local private database, and also share, or compare, their data with other breeders via a central public crop database. The BMS is also anticipated to have enormous positive impact on food security in developing countries in the years ahead, enabling crop breeders to evaluate their progenies using the most sophisticated statistical methods available, and make selections on which lines to advance to the next phase of development in the progression towards more productive and resilient crop varieties. For almost 30 years, the private sector has been implementing molecular-breeding approaches in developing more productive and resilient crops. These approaches allow breeders to select for plant characteristics (traits) early in the breeding process and then test whether a plant has the targeted trait, which they cannot visually identify. Mark hopes that the Workbench will in time enable breeders, in under-resourced public breeding institutes to access some of the leading molecular-marker databases, and make use of the markers therein for the desired traits they are breeding for, along with technical support from molecular breeders to guide them in making their breeding decisions. An Integrated Breeding Multiyear Course (IB-MYC) training course in session in April 2013 for the West and Central Africa group. Clarissa Pimentel, IBP’s Data Manager/Training Specialist, at the front, giving trainees tricks and tips on using FieldLab on the electronic tablet for field data collection. Mark knows that giving breeders the tools and means to integrate molecular breeding into their programmes is one thing. To actually have them adopt them is another. But he has a plan. In keeping with the core mission of GCP, which is to build sustainable capacity in developing-country breeding programmes, Mark proposes to recruit and train selected breeders in molecular-breeding techniques and set them up as champions and advocates for their particular crop or region. Marker implementation methods can be varied but the tools required need to help the breeder make a quick informed decision on what to take forward to the next generation: What plants need to be crossed? Which plants should be kept and which ones discarded? The decision-support tools provided by the IB Workbench will help the breeder make these decisions. Mark oversees the design, testing and deployment of the system that underpins the BMS, ensuring that both the system and the tools embedded in it are easy to use and meet the needs and expectations of the breeders. However, he and his team have had some trouble getting feedback on the system from the breeders it is intended for, due to their inexperience with such tools and systems. That is why he has called on his private-sector contacts, developed when he was at Syngenta where he worked for five years prior to his current assignment. To maximise adoption and use, GCP has been actively engaged in extensive capacity building, and this will be reinforced with a comprehensive awareness-creation and communication effort immediately before and after a projected mid-year release of a newer BMS version incorporating the all-essential user feedback. The impact of the analytical pipeline in developing countries will be particularly enhanced with the availability of efficient user support services, which Mark will be overseeing. VIDEO: IBP’s comparative advantage for developed countries, while also relevant for developed countries. Mark, great post and an exciting development. The use of modern technologies such as markers is highly dependent upon access, reliability and cost. I expect that the BMS will provide information on access but, to what extent will you provide data on reliability and cost? 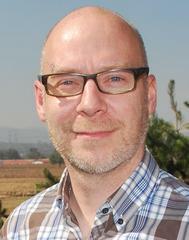 The reason that a large number of breeders, in developed and developing countries, stay with phenotyping and field trials is that they do not see the immediate advantage of using modern technologies and see these as an add-on cost which becomes even more problematic if the tools are not reliable. Again, thanks for your post. I completely agree with your observation on the use of marker technologies in breeding particularly with the clients we are working with. We are not pushing technology for technology sake. Marker information should not be seen as a competitor for funds but should be seen as simply a part of the normal breeding process. In this way I try not to draw a distinction between what is often termed conventional breeding and molecular breeding. Modern breeding will use whatever tools/information to make progress faster and more efficient but we need to demonstrate that markers bring added value to the breeding process. This is where I see that education and training is so critical in the adoption and acceptance of using molecular markers. While we provide access to marker technologies (that are applicable for certain activities) we recognize that we also need to work with the breeders to explain this technology. What technologies are suitable for what objectives (including cost and reliability), where in the breeding stage plan marker information can be useful, for what purposes and importantly how this might change the way they currently work. In terms of reliability I think this is true perhaps of many technologies and not simply marker technology or the tools to analyze markers. One of the key activities of the GCP/IBP is training and capacity building and we are proactive in reaching out to our network of breeders to bring them up to speed on the use of many of the tools/technologies now available. I might suggest that perhaps we should also accept a certain level of risk in using these technologies (be it use of new phenotyping tools or marker technologies). That sometimes there will be some errors, but by ramping up data production through use of these activities these errors may become more like background noise and by being right most of the time we will still be able to make progress. I hope I have gone some way to address your questions and I would certainly welcome any further comments or any comments from other members here.